Samsung Galaxy Note 4 is an older Android phone that remains valued for its durable, plastic design – the best Note smartphone to have this fake leather look to it vs the Note 5 that went with an all-glass look. If you can find it used, it's a lot cheaper than it was when it first launched, and won't explode on you like the Note 7 did last year. 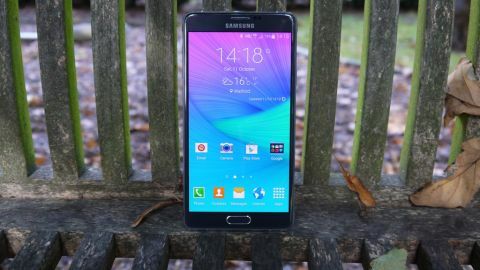 Here were our original thoughts on the Note 4 and its S Pen features. Some said it would never catch on, but over four years on from the original Galaxy Note phablet the fourth generation device - the Samsung Galaxy Note 4 - launched. The Galaxy Note's big screen and S Pen stylus are certainly not for everyone. The Samsung Galaxy S7 and Galaxy S7 Edge offer a more mainstream (and updated) smartphone setup, while the Note 4 brings together big power, a big screen and big productivity - even if it is a little long in the tooth now. If you're after a top-end smartphone which won't break your palm, pocket or handbag then you're probably in the wrong place - this isn't even the best Note handset anymore - but the Galaxy Note 4 still has a lot to offer. You can now pick it up for under £400, $400 (around AU$500) if you don't want to be tied down to a contract. That makes it decidedly cheaper than the Note 5, Note 7, S7 and S7 Edge. The Samsung Galaxy Note 4 is up against the likes of the Nexus 6, LG G Flex 2, Huawei Ascend Mate 7 and the steeply priced iPhone 6 Plus. It's also no longer the newest flagship in Samsung's fleet with the introduction of the Galaxy Note 5, while the Galaxy S7 and Galaxy S7 Edge provide the most cutting edge tech and an improved design. Unlike the previous three iterations Samsung hasn't deemed it necessary to increase the screen size of the Note 4, so it sticks with the same 5.7-inch dimensions of the Galaxy Note 3. It's not the same screen though, as Samsung has given the Galaxy Note 4 a hefty resolution boost - but more on that on the next page. It's not on the same level of design as the Galaxy S6 and S6 Edge which ditch plastic altogether, so if you really don't like this cheaper material then consider these two instead. The new Note 5 has taken the design a step further by mirroring the all metal and glass stylings of the Galaxy S6. If you're looking for the most premium phablet then head over to the newer Note in the series. This, then, was the Note handset with the most premium and accomplished look and feel to date. Samsung is finally providing the build quality its top-end devices have been yearning for and it's since gone even further towards premium perfection with the Galaxy Note 5.